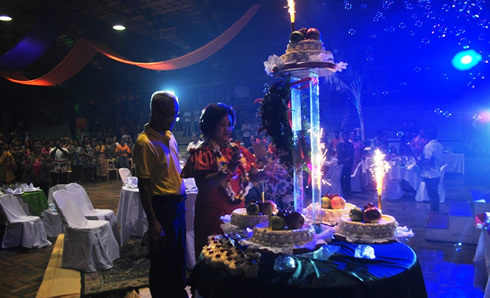 September 13 was a remarkable day for the Western Mindanao State University (WMSU) community as they celebrated the birthday of their dear university president-Dr. Milabel “Bengie” Enriquez-Ho. A tribute program was held for the president on the evening of the said date. Members of the faculty and the administrative personnel donned in their Polynesian-inspired outfit, which reflects Dr. Ho�s vibrant and perky personality. The birthday fete was full of song and dance numbers which were prepared heartily by the faculty members and administrative personnel. An audio-video presentation prepared by the WMSU-Public Affairs Office which was a heartwarming dedication to Dr. Ho set the mood of the occasion. The now 58-year old Dr. Bengie was joined by her father Juan, her husband Ruben, daughter Rubelle Marshah and other relatives and friends in that memorable evening. Other personalities who came to celebrate with her were the City Mayor-Celso L. Lobregat, City Health Officer-Dr. Rodelin M. Agbulos and other city officials.